Control SPACE and TIME to increase efficiency. People Detection at a Glance! People Detection Platform is a video analytics software that detects a person within the camera field of vision in real time, storing the event and sending instant notifications. System can classifie unauthorized individuals while ignoring normal scene activity such as plants, objetcs, etc. This platform is ideal for all types of clients with complex security needs for perimeter and/or internal purposes. It allows users to configure the settings and parameters of the video content analysis to personalize any requirement. Configure the times the system will be activated; identify persons to notify; type of notifications; specific property to safeguard and many more. Users can create Regions of Interest (ROI) and Virtual Lines within the scope of the camera vision to maximize the computing power and effectiveness of the system. People Detection Platform is compatible with all of Guardian’s analytic modules. ¹Processing hardware, cameras, labor cost and other hardware are not included and can be quoted separately. VMS & People Detection Platform requires Device Module License. ¹People Detection Module minimum requirement is 11 devices (cameras). See Ai-Sentinel for less devices. Consultation services are quoted on a case by case basis and can increase depending on the scope of the project. All prices quoted are in US dollars. Prices above do not include tax. New features and updates every month. Service applies to VMS, Database, and Module. 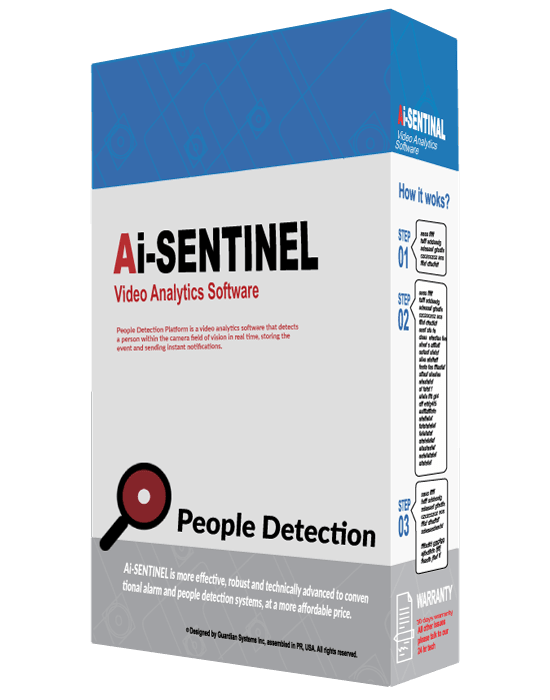 What is the difference between the Ai-Sentinel and the People Detection Module? They are both artificial intelligence platforms that detect humans in a camera field of vision. The Ai-Sentinel is a product that is limited to 10 cameras, (Ai-Sentinel 10). If the User requires analysis in more than 10 cameras, the People Detection Solution is right for you. How many cameras does it scale to? It scales to any number of cameras needed. We simply add more processing hardware to scale to the desired amount. Where is the hardware located? We usually do the processing on site as to avoid data broadband costs. However, we create the architecture the User requires and can do the processing in a centralized location or on a cloud server.